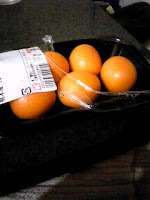 Where I'm from in the United States, there is a wide variety of fruits available at most grocery stores, not to mention the exotic fare you can find in specialty and Asian markets. But as you might imagine, there are some fruits and vegetables common in Japanese supermarkets that you may see rarely or not at all back home. Take, for example, the kinkan (金柑). Kinkans are the Asian variety of what you may know as kumquats. 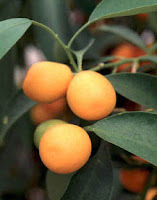 While they seem to have originated in China, they've since been spread to Japan and a number of other Asian countries and certain parts of the Middle East and U.S. As you might suspect, they're citrus fruits, and actually are more hardy than many of their relatives. Their flowers usually bloom in the fall and the fruits develop during the winter. In some countries (including Japan), they are a folk remedy for colds. Just pop one in your mouth and chew. Seriously. While kinkans are also used to make marmalade and jam and in recent years have become increasingly used as drink garnishes or desert ingredients, traditionally they are eaten as is, like grapes. Alternatively, I have read that some people just eat the skin and discard the inner fruit, as counterintuitive as it might sound. Why? Because the skin is the sweetest and most aromatic part of the fruit. The inside is actually rather bitter or tart and sometimes described as "savory." Eating the skin and fruit together can be enjoyable due to the contrasting flavors. Just be careful about eating too many - I found them rather acidic, and my tongue was in a little bit of distress after eating 6 or 7 in one go. Oh, and watch out for seeds! To the left is a little fact chart from NutritionData.com on kumquats, which for all intents and purposes are the same thing. As you can see, one kinkan contains a fair amount of Vitamin C, and small amount of Calcium, Iron, Vitamin A, and fiber. They also provide a little potassium. If you don't think your palate can handle enough of these to make a difference, fret not. As is the case with many fruits, a great deal of the nutritional value is found in the skin. That means if you like you can just eat the sweetest part of the kinkan and still enjoy most of the health benefits. Kinkan juice is also loaded with about the same amount of acid and Vitamin C as lemon juice, so I would imagine it would make a suitable substitute. You know, if you want to squeeze something over your seafood but for some unimaginable reason have a kinkan but no lemons available. I only just tried these out recently, and I have to say I'm a little disappointed I never ate them before. While they're not my new favorite fruit or anything, and I don't plan on snacking on them regularly, I think they make a nice little treat or novelty on occasion. But that's just me. You may find you really enjoy them, and fruits are certainly a good and healthy snacking choice. Final words: Just eat it! I take a pass on these...tried em'..not really liking them. Haha...thanks, Chris. Wish I was good enough to do translation work. Yeah, not for everyone. I can see why you don't like'em. I find their flavor interesting but can't eat more than a handful at a time. Very interesting. I've never even thought of eating one of those, but now I want to try. Haha...thanks, man. Dang, that's embarrassing, but at least I won't make that mistake again.